This nondescript hump is part of the same broad ridge that encompasses Mount Agassiz. Mount Woodside is 4 km west of the Kent Maximum Security prison. A gravel road leads almost to the summit (where a communication hut/antenna is located). A 5 minute bushwack from there to get to the summit where a repeater station is located (and some limited views). A spur off the main road about 4 km up leads to the paragliding launch pad and some good views of the Fraser River and beyond. 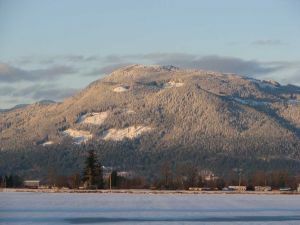 Name Notes: The mountainside to the south of here is locally known as Agassiz Mountain, which is also the name given to the path of Highway 7 over its southern face. This is not to be confused with Mount Agassiz, which is NE of Woodside, towards Harrison Hot Springs. On this rise of Highway 7 is the "BC Scenic Viewpoints" marker for the Fraser Valley Delta; the pull-out affords a fine view of the Chilliwack Prairie and the various sandbars of the Fraser below (eastbound traffic only). There is a "spring" by the roadside just E of this pullout which is actually a surface stream redirected through a pipe. The Halqemeylem name for Mt. Woodside is Qweqwatchem, which means "echo" or literally "holler and hear your voice answer you". This name also includes nearby Mt. Agassiz.